Doctor Who: The Trial Of A Man Playing A Time Lord - Act Three | Warped Factor - Words in the Key of Geek. Christopher Morley returns to court. Namely, is it ever in good cause to bring about the end of another intelligent life-form, however evil they might prove themselves to be? Proof of just how much he's actually changed since hanging up the scarf & abandoning the jelly babies arrives in the conclusion he reaches on that very point. While initially possibly quite rightly stumbling upon the realisation that if he does indeed blow his oldest foes to kingdom come he becomes no better than them, in dealing with the Vervoids it seems he's no longer concerned by such considerations. The thickest of skins, it seems, now resides under that blonde barnet & glam rock coat. 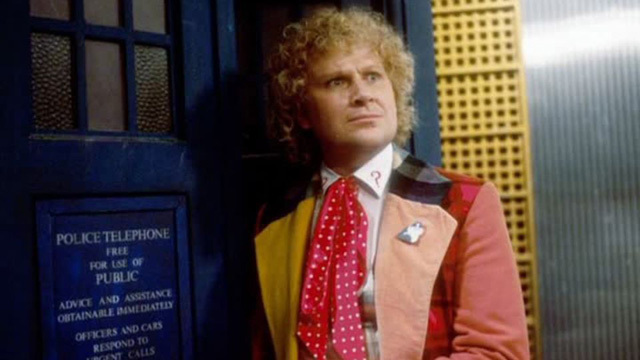 Unlike the previous episodes in the Trial saga- perhaps indirectly inspired by the Key To Time arc which formed Season Sixteen- events here are presented as the Doctor's case for his own defence. Only fair, in legal terms! INQUISITOR: The Doctor is fighting for his life, Valeyard. However, I do take your point. Doctor, are you ready to present your evidence? DOCTOR: Yes. Yes, I am grateful to you, madam, for according me the same privilege as the Valeyard that allowed me access to the Matrix. My excursion will be into the future. VALEYARD: The future? Is it going to be the Doctor's defence that he improves? VALEYARD: This I must see. DOCTOR: My submission concerns a crisis which threatens the lives not only of a group of people confined together with no means of escape, but would, if unresolved, threaten every mortal being on the planet Earth. DOCTOR: Mogar, a planet on the Perseus arm of the Milky Way. INQUISITOR: Did none of the unfortunate creatures survive, Doctor? DOCTOR: No, my lady. Had even a leaf survived and fallen on fertile soil, a Vervoid would have grown. VALEYARD: Every Vervoid was destroyed by your ingenious plan. VALEYARD: Whether or not the Doctor has proved himself innocent of meddling is no longer the cardinal issue before this court. He has proved himself guilty of a far greater crime. INQUISITOR: You refer to Article seven of Gallifreyan law? DOCTOR: No, my lady, that cannot apply! Had a single Vervoid reached Earth, the human race would have been eliminated! VALEYARD: Article seven permits no exceptions. The Doctor has destroyed a complete species. The charge must now be genocide. The same charge which he would have been allowed to carry out scot-free with official licence had he gone ahead with it at the behest of those who now stand as his jurors after being diverted to Skaro via Time Ring! TIME LORD: Continual? We pride ourselves we seldom interfere in the affairs of others. TIME LORD: You, Doctor, are a special case. You enjoy the freedom we allow you. In return, occasionally, not continually, we ask you to do something for us. DOCTOR: I won't do it. Whatever it is, I refuse. DOCTOR: Daleks? Tell me more. TIME LORD: We foresee a time when they will have destroyed all other lifeforms and become the dominant creature in the universe. DOCTOR: That's possible. Tell on. TIME LORD: We'd like you to return to Skaro at a point in time before the Daleks evolved. DOCTOR: Do you mean avert their creation? TIME LORD: Or affect their genetic development so that they evolve into less aggressive creatures. 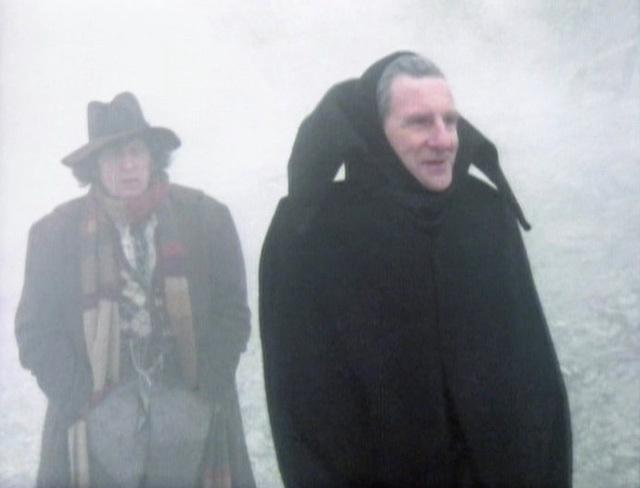 TIME LORD: Alternatively, if you learn enough about their very beginnings, you might discover some inherent weakness. DOCTOR: All right, just one more time. BRIGADIER: If they do decide to launch a second attack, I hope we can count on your help again? DOCTOR: Yes, well, before we go into all that, Brigadier, I think we must discuss terms. DOCTOR: Yes. After all, you do want to take advantage of my services again, don't you? BRIGADIER: I think you'll find the salary is quite adequate. But clearly even after the secret of the TARDIS was returned to him once more & he was able to take advantage following his post-Planet Of The Spiders regeneration, he couldn't escape. 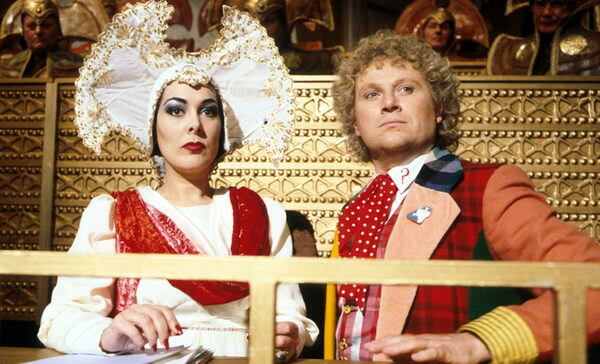 Trial once more awaited him after a murder charge in The Deadly Assassin, temporarily minus a companion. It also marked the return of his intellectual equal & foe, albeit hideously burnt & considerably more crazed than when first they met. Aptly enough he returns again in Act Four here having taken on the body of Tremas & escaped Traken following its near-collapse. "So, a new body at last."